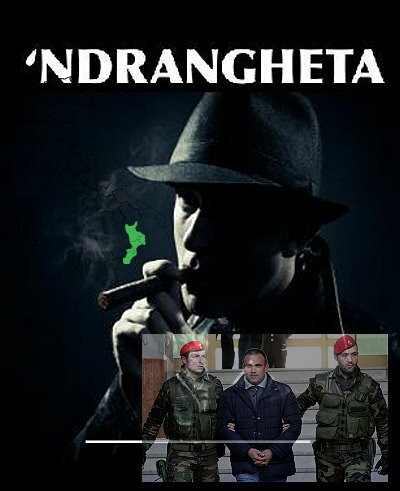 The ‘Ndrangheta is a criminal organization in Italy, centered in Calabria (near Sicily). Despite not being as famous abroad as the Sicilian Cosa Nostra (or Mafia), the ‘Ndrangheta managed to become the most powerful crime syndicate of Italy in the late 1990s and early 2000s. A US diplomat has estimated that the organization’s drug trafficking, extortion and money-laundering activities account for at least 3 percent of Italy’s GDP. Since the 1950s, the organization has spread towards the north of Italy, and worldwide. Hollywood has yet to jump on the ‘Ndrangheta bandwagon, so we’ll look to the BBC to provide us with some insight. In 1861 the prefect of the province of Reggio Calabria noted the presence of so-called camorristi – a term used at the time since there was no formal name for the gangster phenomenon in Calabria (The Camorra was the older and better known criminal organization in Naples). Since the 1880s, there is evidence of ‘Ndrangheta-type groups in police reports and sentences by local courts. At the time they were often referred to as the picciotteria, onorata società (honored society), Camorra, and Mafia. These secret societies were organized hierarchically with a code of conduct that included omertà (the code of silence), according to a sentence from the court in Reggio Calabria in 1890. An 1897 sentence from a court in Palmi mentioned a written code of rules found in the village of Seminara, based on honor, secrecy, violence, solidarity (often based on blood relationships), and mutual assistance. The Calabrian word ‘Ndrangheta derives from the Greek “andragathía” for “heroism” and “virtue” or “andragathos”, a blend of “andròs” (“man”) and “agathòs” (“good”), meaning “a courageous man”. In many areas of Calabria the verb ‘ndranghitiari, from the Greek “andragatizomai”, means “to engage in a defiant and valiant attitude”. The first time the word ‘Ndrangheta was mentioned before a wider audience was by the Calabrian writer Corrado Alvaro in the Corriere della Sera, in September 1955. Until 1975, the ‘Ndrangheta restricted their Italian operations to Calabria, mainly involved in extortion and blackmailing. Then a gang war started, resulting in the deaths of 300 people. The prevailing faction began to kidnap rich people from northern Italy for ransom. It is believed that John Paul Getty III was one of their victims. The Second ‘Ndrangheta War raged from 1985 to 1991. The bloody six-year conflict between the Condello-Imerti-Serraino-Rosmini clans and the De Stefano-Tegano-Libri-Latella clans left more than 600 dead. In the 1990s, the organization started to invest in the illegal international drug trade, mainly importing cocaine from Colombia. Deputy President of the regional parliament of Calabria, Francesco Fortugno was killed by the ‘Ndrangheta on 16 October 2005 in Locri. The national government started a large-scale enforcement operation in Calabria and arrested numerous ‘ndranghetisti – including the murderers of Fortugno. In March 2006, the national anti-Mafia prosecutor announced the discovery of a narco submarine in Colombia, allegedly being constructed on behalf of the ‘Ndrangheta for smuggling cocaine. The ‘Ndrangheta has recently expanded its activities to Northern Italy, mainly to sell drugs, and to invest in legal businesses which can be used for money laundering. The mayor of Buccinasco was threatened when he tried to halt these investments. In May 2007, twenty members of ‘Ndrangheta were arrested in Milan. On 30 August 2007, hundreds of police raided the town of San Luca, the focal point of the bitter San Luca feud between rival clans among the ‘Ndrangheta. Over 30 men and women, linked to the killing of six Italian men in Germany, were arrested. On 9 October 2012, following a months-long investigation by the central government, the City Council of Reggio Calabria headed by Mayor Demetrio Arena was dissolved for alleged ties to the group. The move came after unnamed councilors were suspected of having ties to the ‘Ndrangheta under the 10-year center-right rule of the previous Mayor, Giuseppe Scopelliti. Arena and all 30 city councilors were sacked, to prevent any “Mafia contagion” in the local government. This was the first time the government of a provincial capital was dismissed. Three central government-appointed administrators will govern the city for 18 months until new elections. ‘Ndrangheta infiltration of political offices is not limited to Calabria. On October 10, 2012, the commissioner of Milan’s regional government in charge of public housing, Domenico Zambetti of People of Freedom (PDL), was arrested on accusations he had paid €200,000 to the ‘Ndrangheta in exchange for an election victory, and to extort favors and contracts, including construction tenders for the World Expo 2015 in Milan. Zambetti’s arrest marked the biggest case of ‘Ndrangheta infiltration so far uncovered in northern Italy, and prompted calls for Lombardy governor Roberto Formigoni to resign. Italian anti-organized crime agencies estimated in 2007 that the ‘Ndrangheta has an annual revenue of about €35–40 billion (US$50–60 billion), which amounts to approximately 3.5% of the GDP of Italy. This comes mostly from illegal drug trafficking, but also from ostensibly legal businesses such as construction, restaurants, and supermarkets. The ‘Ndrangheta has a strong grip on the economy and governance in Calabria. According to a US Embassy cable released by Wikileaks, Calabria would be a failed state if it were not part of Italy. The ‘Ndrangheta controls huge segments of its territory and economy, and law enforcement is hampered by a lack of both human and financial resources. The principal difference with the Mafia is in recruitment methods. The ‘Ndrangheta recruits members on the basis of blood relationships, resulting in an extraordinary cohesion within the family clan that presents a major obstacle to investigation. Sons of ‘ndranghetisti are expected to follow in their fathers’ footsteps, and go through a grooming process in their youth to become giovani d’onore (boys of honor) before they eventually enter the ranks as uomini d’onore (men of honor). There are relatively few Calabrian Mafiosi who have opted out to become a pentito (or state’s witness). At the end of 2002, there were 157 Calabrian witnesses in the state witness protection program. Unlike the Sicilian Mafia in the early 1990s, they have meticulously avoided a head-on confrontation with the Italian state. Prosecution in Calabria is also hindered by the fact that Italian judges and prosecutors who score highly in exams get to choose their posting. Those who are forced to work in Calabria will usually request to be transferred right away. With weak government presence and corrupt officials, few civilians are willing to speak out against the organization. Both the Sicilian Cosa Nostra and the ‘Ndrangheta are loose confederations of about one hundred organized groups, also called “cosche” or families, each of which claims sovereignty over a territory (usually a town or village). There are approximately 100 of these families, totaling between 4,000 and 5,000 members in Reggio Calabria (Other estimates mention 6,000-7,000 men). Worldwide there may be some 10,000 members. Most of the groups operate in the Province of Reggio Calabria, although some of the recorded 70 criminal groups based in the Calabrian provinces of Catanzaro and Cosenza also appear to be formally affiliated with the ‘Ndrangheta. The families are concentrated in poor villages in Calabria such as Platì, Locri, San Luca, Africo, and Altomonte, as well as the main city and provincial capital, Reggio Calabria. San Luca is considered to be the stronghold of the ‘Ndrangheta. According to a former ‘ndranghetista, “almost all the male inhabitants belong to the ‘Ndrangheta, and the Sanctuary of Polsi has long been the meeting place of the affiliates.” Bosses from outside Calabria (some from as far as Canada and Australia) regularly attend meetings at the Sanctuary of Polsi. An ‘Ndrangheta crime family is called a locale (place; plural: locali). A locale may have branches, called ‘ndrina (plural: ‘ndrine), in the districts of the same city, in neighboring towns and villages, or even outside Calabria, in cities and towns in the industrial North of Italy in and around Turin and Milan. Sometimes sub-units, or sotto ‘ndrine are established. These enjoy a high degree of autonomy; they have a leader and independent staff. In some respects, the ‘ndrine have become more powerful than the locale on which they formally depend. Some observers maintain that the ‘ndrina is the basic organizational unit. Each ‘ndrina is “autonomous on its territory and no formal authority stands above the ” ‘ndrina boss”, according to the Antimafia Commission. The ‘ndrina is usually in control of a small town or a neighborhood. If more than one ‘ndrina operates in the same town, they form a locale. The ‘ndrine largely consist of men belonging to the same (blood) family lineage. Salvatore Boemi, Anti-mafia prosecutor in Reggio Calabria, told the Italian Antimafia Commission that “one becomes a member for the simple fact of being born in a Mafia family,” although other reasons might attract a young man to seek membership, and non-kin have also been admitted. At the bottom of the chain of command are the picciotti d’onore or soldiers, who are expected to perform tasks with blind obedience until they are promoted to the next level of cammorista, where they will be granted command over their own group of soldiers. The next level is known as santista, and higher still is the vangelista, at which point the up-and-coming gangster has to swear their dedication to a life of crime on the Bible. The quintino is the second highest level of command in a ‘Ndrangheta clan, being made up of five privileged members of the crime family who report directly to the boss, or capobastone (head of command). At least since the end of the 19th century, stable mechanisms for coordination and dispute settlement have existed. Contacts and meetings among the bosses of the locali were frequent. In the ‘Ndrangheta an overall coordinating body was created only in 1991, as the result of negotiations to end years of inter family violence. At least since the 1950s, the chiefs of the ‘Ndrangheta locali have met regularly near the Sanctuary of Our Lady of Polsi in the municipality of San Luca during the September Feast. These annual meetings, known as the crimine, have traditionally served as a forum to discuss future strategies and settle disputes among the locali. The assembly exercises weak supervisory powers over the activities of all ‘Ndrangheta groups. Strong emphasis is placed on the temporary character of the position of the crimine boss; a new representative is elected at each meeting. Far from being the “boss of the bosses,” the capo crimine has comparatively little authority to interfere in family feuds, or to control the level of interfamily violence. Security concerns have led to the creation in the ‘Ndrangheta of a secret society within the secret society: La Santa. Membership in the Santa is known only to other members. La Santa allows bosses to establish close connections with state representatives – even to the extent that some are allegedly affiliated with the Santa. Since the end of the Second ‘Ndrangheta war in 1991, the ‘Ndrangheta is ruled by a collegial body or Commission, known as La Provincia. Its primary function is the settlement of inter-family disputes. The body (also referred to as the Commission, like its Sicilian counterpart), is composed of three lower bodies, known as mandamenti: one for the clans on the Ionic side (the Aspromonte mountains and Locride) of Calabria, a second for the Tyrrhenian side (the plains of Gioia Tauro) and one central mandamento for the city of Reggio Calabria. Economic activities of ‘Ndrangheta include international cocaine and weapons smuggling, with Italian investigators estimating that 80% of Europe’s cocaine passes through the Calabrian port of Gioia Tauro and is controlled by the ‘Ndrangheta. ‘Ndrangeta and Sicilian Cosa Nostra groups sometimes act as joint ventures in cocaine trafficking enterprises. Further activities include skimming money off large public work construction projects, money laundering, and traditional crimes such as usury and extortion. ‘Ndrangheta invests illegal profits in legal real estate and financial ventures. Outside Italy, the ‘Ndrangheta has had a remarkable ability to establish branches abroad, mainly through migration. ‘Ndrine are reported to be operating in northern Italy, Germany, Belgium, the Netherlands, France, Eastern Europe, the United States, Canada, and Australia. In November 2006, a cocaine trafficking network was dismantled that operated in Argentina, Spain and Italy. The Argentinean police said the ‘Ndrangheta had roots in the country and shipped cocaine through Spain to Milan and Turin. Known by the name “The Honored Society”, the ‘Ndrangheta controlled Italian-Australian organized crime all along the East Coast of Australia since the early 20th century. ‘Ndrangheta operating in Australia include the Sergi, Barbaro and Papalia clans. In Belgium, ‘Ndrangheta clans purchased almost “an entire neighborhood” in Brussels with laundered money originating from drug trafficking. On 5 March 2004, 47 people were arrested, accused of drug trafficking and money laundering to purchase real estate in Brussels for some 28 million euros. The activities extended to the Netherlands, where large quantities of heroin and cocaine had been purchased by the Pesce-Bellocco clan from Rosarno and the Strangio clan from San Luca. In Canada, the ‘Ndrangheta is believed to be involved in the smuggling of unlicensed tobacco products through ties with criminal elements in cross-border Native American tribes. A Canadian branch labelled the Siderno Group – because its members primarily came from the Ionian coastal town of Siderno in Calabria – has been based in Canada at least since the 1950s. Siderno is also home to one of the ‘Ndrangheta’s biggest and most important clans, heavily involved in the global cocaine business and money laundering. According to a study by the German foreign intelligence service, the Bundesnachrichtendienst (BND), ‘Ndrangheta groups are using Germany to invest cash from drugs and weapons smuggling. Profits are invested in hotels, restaurants and houses, especially along the Baltic coast and in the eastern German states of Thuringia and Saxony. Investigators believe that the Mafia’s bases in Germany are used primarily for clandestine financial transactions. The earliest evidence of ‘Ndrangheta activity in the U.S. points to an intimidation scheme run by the syndicate in Pennsylvania mining towns; this scheme was unearthed in 1906. Current ‘Ndrangheta activities in America mainly involve drug trafficking, arms smuggling, and money laundering. It is known that the ‘Ndrangheta branches in North America have been associating with Italian-American organized crime. The Suraci family from Reggio Calabria has moved some of its operations to the U.S. The family was founded by Giuseppe Suraci who has been in the United States since 1962. His younger cousin, D’Marconi, runs the family in Calabria. Sadly, we’ve reached the end of this story.